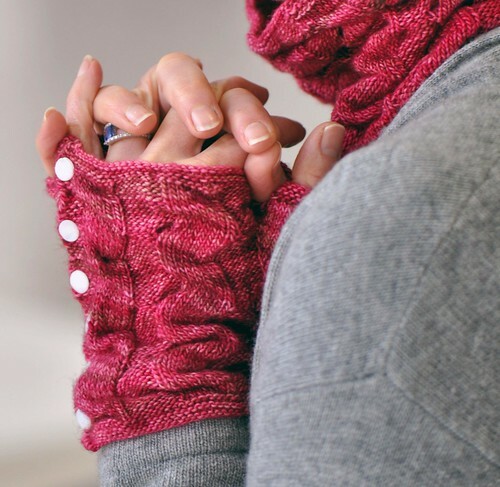 Matching handwarmers and cowl in an intruiging folded fabric looks cabled but isn’t! The waves undulate gently, trapping air and keeping you warm. Worked in fine, slightly thick and thin yarn that comes in brilliant colours. 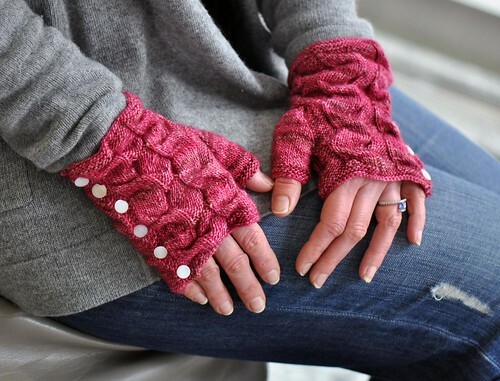 Both thehandwarmers and cowl are worked flat and closed with tiny mother of pearl buttons. 140 (170) yds / 128 (156)m for Handwarmers. 270 (325) yds / 247 (298)m for Cowl. Shown in Madelinetosh Tosh Merino Light (100% superwash merino wool; 440 yds / 402m per 4oz skein) - 1 skein of Fragrant for 9” / 23cm handwarmers and 20” / 51cm cowl. 5 page PDF pattern includes photo tutorial for Fold pattern and abbreviations. Measurements in imperial and metric.